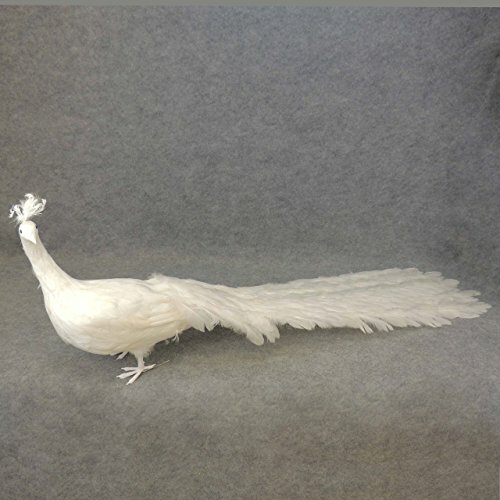 A tail full of fluffy white feathers and a soft, feathered body creates an elegant and regal bird perfect for a variety of occasions. Display this life sized artificial peacock elegantly. This peacock boasts a 25" long body and a breathtaking 35" long closed tail. The body of this bird is lined with pure, white feathers. Its tail is made of white feathers on a white plastic body. This peacock has realistic plastic feet that contain heavy duty wires to help secure this large bird. Peacock comes in two pieces (body and tail) and is secured with a clip on the tail. Price is for one artificial white peacock.